Q: How do you feel about your family? A: My mother betrayed me, and so did her family. I have no love for them. They are not my family. The other Forbidden Sons, the ones born under the curse, like me, they are my family now. Q: What do you want from life? Q: If you were granted three wishes, what would you ask for? A: This is a human question. I am not human. I am more. I do not need wishes. I have what I need to create my own destiny…power and time. Q: What, in the outside world, is preventing you from getting it? A: Only one thing stands in my way, the Timewalkers. Once they are gone, no one can stop me. A: I have never been in love, and I have loved only once. My son. And even he was taken from me. Destroyed by a Timewalker, a human. I will have justice, it’s why I traveled through time. Q: What parts of loving come easy for you? Hard? A: Loving is easy, an idiot’s folly. Love is nothing more than self-inflicted pain, and I am not a masochist. I do not love. I take. I dismiss. I rule. Nothing else is required. Q: How do you decide if you can trust someone? A: Easily. I don’t. Perhaps, some day, I’ll get a dog, but even that would most likely bite me. Q: When you walk into a room, what do you notice first? Second? A: I notice power. People. Machines. It doesn’t matter what form the power takes. Power and time are the only two things that matter. Q: What do you consider your special talent? Q: What do you wish your special talent was? A: Finding Timewalkers so I can kill them faster. Q: Is there anything you’ve always wanted to do but haven’t done? What would happen if you did it? A: I want to go home, to Itara. But if I did that now, before the Queen is dead, I would be executed on sight. First, the Queen needs to die. Then I will return to my home world and take what’s rightfully mine. Q: How do you feel about your life right now? What, if anything, would you like to change? A: I have been in exile, in hiding, for centuries. This time, I want to win. This time, the human Timewalker must die. Be sure to come back to read more about M.L. 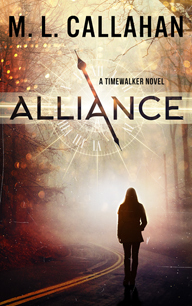 and ALLIANCE, A Timewalkers Novel, on Wednesday’s Karen’s Killer Book Bench. Happy Reading! Sounds interesting. I would love to win a copy of your book. Good morning, M.L., and welcome to Karen’s Killer Book Bench! I cannot wait to read this book. I love SciFi with romance, suspense, time travel and…sounds like so much fun! !